Buy 12 or more for $106.87 each. The CSB He Reads Truth Bible is a great resource for men seeking to know God's Word. It includes well-crafted theological memos to increase biblical literacy. Each book of the Bible is color coded by genre and features detailed book introductions, a reading plan, and full-color maps, charts, and timelines. This Bible invites every man to count himself as part of the He Reads Truth community of "Men in the Word of God every day." The He Reads Truth Bible features the highly readable, highly reliable text of the Christian Standard Bible. (CSB). The CSB stays as literal as possible to the Bible's original meaning without sacrificing clarity, making it easier to engage with Scripture's life-transforming message and to share it with others. 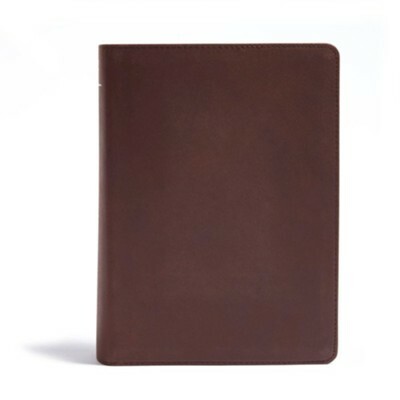 I'm the author/artist and I want to review CSB He Reads Truth Bible, Brown Genuine Leather with Thumb Index.